Bookmarking site Instapaper has run into trouble with the EU's new General Data Protection Regulation (GDPR) rules, and has temporarily shut down operations in Europe until it can get its house in order. Until then, users in Europe will need to look elsewhere for a scrapbook to save text, articles and pages. Your browser probably has a read-it-later tool built in, but it might not be the best one for your needs. The best Instapaper alternatives work across browsers and devices, sync your notes, and let you save them to read offline. They also give you a choice of what to save (a text selection, a screen grab, a whole page or a bookmark, for example) and let you use tags and folders to keep everything organized. With that in mind, here's our pick of the best alternatives to Instapaper – at least, until it gets its databases in order. Pocket is integrated into Firefox (both the desktop and mobile versions), but you can use it with any browser by installing the appropriate plugin. When you come across something interesting, simply pop it into your Pocket (using the button in your address bar if you're using Firefox, or the browser extension if not) and read it later on any device. Pocket also suggests new things for you to read, presenting them when you open a new tab, and delivering a daily digest to your inbox. These are articles other Pocket users have saved, and will often throw up something you'll find interesting. Pocket Premium is ad-free and keeps a permanent cache of all the pages you bookmark – even if they change in the future. There's also advanced search to help you find more content you might be interested in, suggested tags, and the ability to repeat recent searches. Unlike most Instapaper alternatives, Pocket gives you the option of syncing content to your device to read offline later – a great option if you're about to head off on a long flight. This, combined with its flexibility, makes it our favorite Instapaper alternative. Evernote is an excellent read-it-later service that's best used together with the Clip to Evernote browser extension. With a click of a button, you can 'clip' a selection of text, an article, a page or an entire site, add tags, and choose a folder where the clip should be saved. Evernote Basic lets you sync notes between two mobile devices, making it easy to clip articles using the desktop browser extension, then read them later on a phone or tablet. You can sync up to 60MB content per month, and there's a maximum note size of 25MB. That might not go far enough if you want to sync videos, but for text articles and images, it's fine. Evernote premium is aimed more at businesses. It can sync across as many devices as you like, search within Office documents and PDFs, and accepts scanned business cards. It also lets you find related content – a feature that comes as standard in Pocket. You can sync up to 10GB content per month, and the maximum note size is 200MB. Evernote Business is the same, but with even more bandwidth per month. Evernote has all sorts of handy little touches that you'll come to really appreciate as you use it more frequently. For example, it remembers which settings you used last time – ideal if you're bookmarking items for a project and want to keep everything organized. Google Keep is another great cross-platform alternative to Instapaper, with apps for Android and iOS, plus as a Chrome extension. Keep also available as a web app that you can use in any browser, but you really need the Chrome extension to get the best experience. Navigate to a page or select a chunk of text, then click the button to add a title, comment and tags. There's no need to click 'Save' – Keep will save and sync it automatically. Keep integrates neatly with Google's other products, making it a convenient choice if you're an Android user and already embedded in Google's ecosystem. Keep also functions as a to-do list, with options for note-taking and creating tasks. Once you've finished a job, you can mark it as complete and feel rather pleased with yourself – then reward yourself by reading all those articles you bookmarked throughout the day. 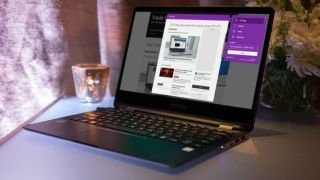 Just as Keep will be a natural partner if you're heavily invested in Google's system of apps, OneNote will fit neatly into your life if you're a Microsoft fan. Microsoft's note-taking tool has more of a business slant than most, but with the Web Clipper browser extension it makes a great alternative to Instapaper. You can clip a full page, an article, a selected part of the screen or a bookmark, then it to a notebook of your choice. It also integrates with the context menu, so you can right-click items on a webpage to clip them. There's no way to add tags to your clipped articles, but OneNote is slick and well designed, and integrates neatly with the rest of Microsoft's apps. If you're an Apple fan, Reading List will be the natural choice when you want to save an article or webpage to read later. Open a webpage in Safari, tap the 'Share' icon, then select 'Add to reading list'. There are no fancy options like tagging, but it's very simple to use. You can search through your reading list to find a specific article, mark items as read without deleting them, and it's cached automatically so you can read everything offline. It's a shame there's no way to add just a selection of text, or organize pages into categories, but that's the price of simplicity. There are no plugins available for other browsers, and there's no Android app. This lack of flexibility keeps Apple Reading list from hitting a higher spot in our roundup of Instapaper alternatives, but if you only use Apple's devices then it comes highly recommended (and already installed).